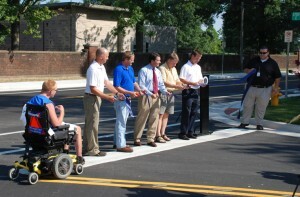 Evansville Mayor Jonathan Weinzapfel held a ribbon cutting ceremony on July 21, 2011 to officially re-open Virginia St./Oak Hill Rd. between Hwy 41 and Pigeon Creek. J.H. Rudolph was involved in the complete reconstruction of the roadway, including re-paving, adding dedicated bike lanes, adding curbs and gutters, adding and/or repairing sidewalks and ADA-compliant curb ramps, as well as improving drainage. Also connected to METS bus routes, the new Oak Hill Rd. is a “complete street” in that it’s designed to accommodate all modes of transportation. Representatives from J.H. Rudolph & Co., Inc., the City Engineer’s and Mayor’s Offices, American Structurepoint, Inc. and the Evansville Metropolitan Planning Organization (MPO) were invited to participate in the ceremony. Casey Lasher, Project Manager, represented J.H. Rudolph by taking part in the actual ribbon cutting. 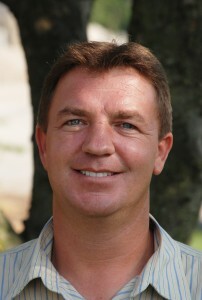 Casey Lasher, J.H. Rudolph, joins Evansville Mayor Jonathan Weinzapfel and others during the Oakhill Road Ribbon Cutting. The Oak Hill Road project started at US 41 intersection and continued through the Weinbach Intersection to just short of Morgan Ave. The project picked up again just north of Morgan Avenue and ended at and included improvements on the Pigeon Creek Bridge. The total project cost was approximately $8,388,300. $2.6 million in Highway and Bridge Infrastructure funds allocated to the Evansville Metropolitan Planning Organizations (MPO) through the American Recovery and Reinvestment Act of 2009 were applied to the project, $387,065.61 was paid with local funds and the balance was funded from our regular allocation of Federal Surface Transportation Program (STP) funds administered to MPO through INDOT. The Project Engineer/Inspector for this project was American Structurepoint Inc. based out of Indianapolis, IN. Casey Lasher was the J.H. Rudolph Project Manager. 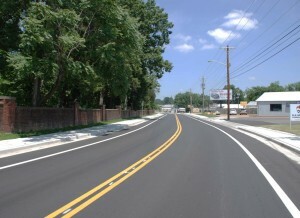 A completed portion of Oakhill Road. The project was originally phased to be constructed half at a time and was to allow one-way traffic through the project. At the early stages of the project it was identified by J.H. Rudolph and the Project Engineer that the project would not be complete by the July 20, 2011 completion date due to the multiple phases of work and utility relocations. Therefore, with cooperation from INDOT, the City of Evansville, and American Structurepoint, and after numerous meetings with City officials, we were allowed to close the road to thru traffic from US 41 to Weinbach Avenue to expedite the utility relocations and all the other work. We had to maintain a driving surface throughout construction for the local residents and local businesses. The areas north of Weinbach and north of Morgan Avenue were constructed half at a time as the original plan. In April 2010, the majority of the major utility companies started relocating their facilities to allow room for the new construction. Also, our subcontractor, Deig Brothers installed approximately 3,600 LFT of new 30″ water main and around 1,400 LFT of new 8″ water main. This work lasted until around the end of June 2010. J.H. Rudolph started our portion of the work in June 2010. The scope of work for this project was to widen Oak Hill Road and make it a “complete” street by adding bike lanes, full-depth asphalt pavement, new sidewalks, new curb & gutter, new drainage systems, a new traffic signal at Weinbach and new road signs. The project also consisted of widening the Pigeon Creek Bridge along with other misc. improvements. J.H. Rudolph’s work consisted of installing approximately 7,200 LFT of various size storm sewer along with 112 drainage structures. We also excavated approximately 25,000 CYS of dirt and placed approximately 18,000 tons of #53 stone and crushed concrete to build the new sub grade. 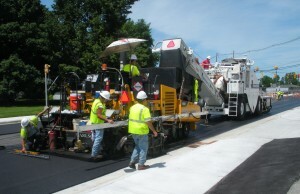 Finally, we placed approximately 24,000 Tons of new asphalt. There were also many subcontractors that played a major role in the success and completion of this project. Ragle Inc. performed the bridge widening and miscellaneous improvements on the Pigeon Creek Bridge. JBI Construction performed all the concrete curb & gutter, sidewalks, and concrete drive approaches. Hummel Electric installed the new signal improvements at Weinbach Avenue and also installed all of the new road signs. CLS Industries provided all of the Traffic Control Equipment/signage for the project and also installed the final thermoplastic pavement markings. Earth Images installed all of the seeding and sodding for this project. The project was around 85% complete at the end of 2010. Winter arrived early in December 2010 and we shut down the project until the Spring of 2011. We started back to work in April of 2011 and officially finished the project on July 18, 2011 which was two days earlier than the project completion date of July 20, 2011. Paving on Oakhill Road earlier this year. Justin D. Kloszewski has joined J.H. Rudolph & co., Inc. as Business Development Manager. Justin comes to J.H. Rudolph from Mesa, Arizona where he most recently worked as General Manager for Polski, Inc. specializing in earth moving and asphalt paving in the commercial market. Before that, he was a Divisional Manager at Sunland Asphalt. You are currently browsing the J.H. Rudolph and Co., Inc. blog archives for August, 2011.